When scrapping a vehicle equipped with an srs or disposing of the front passenger side knee airbag, be sure to deploy the airbag first in accordance with the procedure described below. If any abnormality occurs with the airbag deployment, contact the service dept. Of toyota motor sales, u.S.A., Inc.
Never dispose of a front passenger airbag with an unactivated airbag. When activating the airbag, stand at least 10 m (33 ft.) Away from the airbag. The airbag becomes very hot when it is deployed. Do not touch it for at least 30 minutes after activation. Use gloves and safety glasses when handling a deployed airbag. Do not apply water to a deployed airbag. Remove the glove compartment door (see page ip- 6). 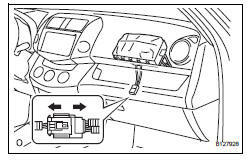 Disconnect the front passenger airbag connector. 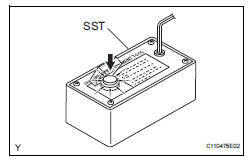 Connect sst (a) to sst (b). 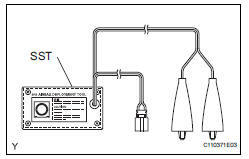 Then connect sst (b)'s connector to the cable. The airbag becomes extremely hot when it is deployed. Do not touch it for at least 30 minutes after deployment. When disposing of the airbag, never use the customer's vehicle to deploy the airbag. Remove the front passenger airbag (see page rs- 350). 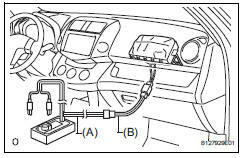 When removing the airbag, work must be started 90 seconds after the ignition switch is turned off and after the cable is disconnected from the negative (-) battery terminal. 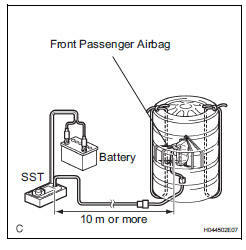 When storing the airbag, keep the airbag deployment side facing upward. 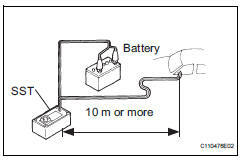 Using service wire harnesses for the vehicle, tie down the airbag to a tire. Use a tire that you are planning to throw away, as the airbag deployment may damage the tire. Do not use wire harnesses that are too thin or any other substitute items to tie down the front passenger airbag. They may snap when the airbag deploys. 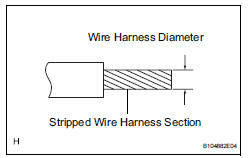 Always use vehicle wire harnesses that have an area of at least 1.25 Mm2 (0.0019 In.2). Position the airbag inside the tire so that the brackets contact the tire. 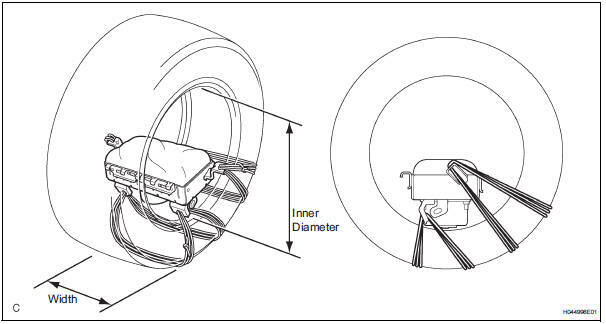 Wind 3 wire harnesses at least twice around the airbag brackets and tire. Tightly wind the wire harnesses around the brackets so that there is no slack. Make sure that the wire harnesses are tight. If there is slack in a wire harness, the airbag may come loose when it is deployed. Always tie down the airbag with the airbag deployment side facing inside the tire. Connect the sst connector to the airbag. Place at least 2 tires under the tire to which the airbag is tied. 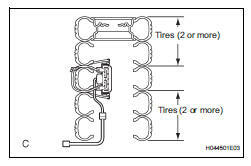 Place at least 2 tires on top of the tire to which the airbag is tied. The top tire should have a disc wheel installed. Use a disc wheel that you are planning to throw away, as the airbag deployment will damage the disc wheel. 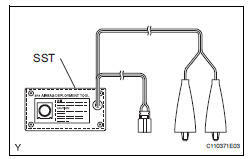 To avoid damaging the sst connector and wire harness, do not lock the secondary lock of the twin lock. Also, secure some slack for the sst wire harness inside the tire. Check that no one is within a 10 m (33 ft.) Radius of the airbag. Remove the airbag from the tire. Place the airbag in a plastic bag, tie it tightly and dispose of it in the same way as other general parts.